It’s a Wonderful Life (1946, dir. Frank Capra): Because it was in the public domain for so many years during the 70s and 80s, many people of a certain age take this film for granted because they saw it over and over on late night television chopped up with commercials. The famous story of a suicidal man who receives a visit from an angel on Christmas Eve has become a quintessential holiday tale, but it’s not the suicide theme that makes it such an ultimate existential film. 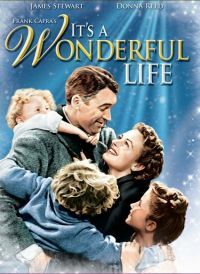 Rather, it is the film’s stark portrayal of what the world would have been like if George Bailey had never been born—the dark and graphic illustrations of how one person’s life touches so many others—is the ultimate portrait of Being-in-the-World, of how nothing happens without relationship, even if we are unaware how much we impact those around us. A Christmas Carol (1951, dir. Brian Desmond-Hurst): Arguably the best cinematic version of Dickens’ profound tale of self-reflection and self-examination throughout the night from Christmas Eve to Christmas Day. Alistair Sim as Ebenezer Scrooge takes us on an emotional rollercoaster ride, as we feel his hatred and disgust, his fear, his sadness and longing, his transformation, and ultimately, his extreme joy. Runner-up is the 1938 Reginald Owen version, although I do know some people who strongly recommend George C. Scott’s more modern 1970 interpretation of the character, all of which speak to the timelessness of Dickens’ story—we are never too old or too set in our ways to become more compassionate Beings, as the only things are givens are that we are born and we die. Meet John Doe (1941, dir. Frank Capra): An earlier Frank Capra film that also focuses on a suicide on Christmas Eve. In this case, a publicity gag suggesting a “John Doe” will be committing suicide to protest the state of civilization turns from a gag to real life, as the man hired to play John Doe (Gary Cooper) identifies progressively more with the idealized character he is playing. Even 70-plus years later, the story is completely modern even if some of the details have some whiskers. And the scene where Edward Arnold, the rich media mogul, drinks a toast alone in front of his Christmas tree, is a gorgeous image of existential isolation. The Bishop’s Wife (1947, dir. Henry Koster): Here, Cary Grant is literally an angel—one sent down to guide an unbelieving bishop (David Niven) who is so focused on building a towering cathedral that he forgets what is really important. Underneath the romantic comedy surface—will the angel Grant romance the bishop’s wife (Loretta Young) away from the mortal bishop—is a deeper meditation on what gives life its real meaning—material objects or relationships with friends and loved ones. A Charlie Brown Christmas (1965, dir. Bill Melendez): Like The Bishop’s Wife, the classic holiday animated special also struggles with issues of meaning. The image of the sad little Christmas tree that Charlie Brown buys and that Lucy and the others initially criticize but that comes to life when it receives “a little love” a simple but profound message of compassion. And often the simplest things are paradoxically the hardest to do.